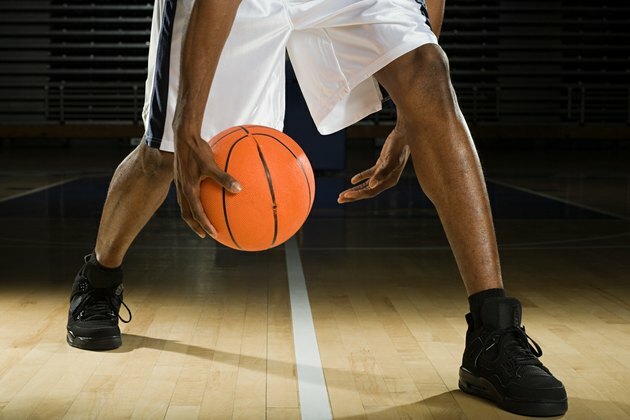 You have a couple of options for improving the grip on your worn-out basketball shoes. The first is having the shoes resoled by a repair service that specializes in sports shoes. Typically, shoe services include patching and re-stitching the uppers as part of the service. Another option is restoring the soles in a way that reduces slipping and improves grip. In the event you don’t use your basketball shoes every day, restoring the soles might be a cost-effective solution. Mix a solution of fresh water and liquid dish soap in a one-gallon plastic bucket. Clean the rubber soles and rubber sides of the soles using a stiff bristle brush and the soapy solution. Scrub the rubber surfaces thoroughly, making sure to remove dirt and any debris from the recesses of the grooves and textured treads on the soles. Immerse the bristles of a wire brush in the soapy water. Scrub the soles and sides of the shoes thoroughly with the wire bristles to open the surface pores of the rubber. Rinse the soles and sides of the soles with fresh water. Dry the soles and sides with paper towels. Put on latex gloves. Apply a generous amount of sports shoe color restorer to a clean rag. Coat the soles and sides of the shoes thoroughly with the color restorer. If necessary, apply more color restorer to the rag as you go. Place the shoes on a table or the floor with the soles facing up. Allow the color restorer to fully activate until the soles and sides of the shoes brighten noticeably. Put the shoes on and test the grip on a hardwood or other smooth floor. It might be possible to put more grip on the soles by scrubbing a second time with the wet wire brush, followed by another application of color restorer. Soles must have some degree of texture or grooves. Shoes with completely worn soles should be resoled. Do not attempt to deepen the grooves or treads using a knife or a heated metal object.